Dr. Frances Cress Welsing, the famed 80-year-old afro-centrist, has died. Welsing’s death was announced by close friends on social media and later confirmed by family members. 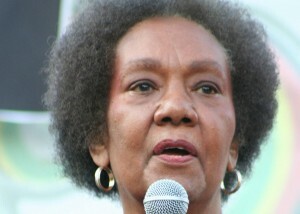 “RIP to the elder, Dr. Frances Cress Welsing, the inspiration behind ‘Fear of a Black Planet,’” said Chuck D, the leader of the groundbreaking rap group, Public Enemy, whose 1990 “Fear of a Black Planet” album sold more than 1 million copies in less than two weeks and is viewed as one of the greatest and most important recordings ever. Popular Democratic strategist Donna Brazile said Welsing died of complications from a stroke she suffered earlier in the week. Born in Chicago on March 18, 1935, Welsing, a psychiatrist, is noted for her “Cress Theory of Color Confrontation,” which explores the practice of White supremacy. In 1991, she authored the book, “The Isis Papers: The Keys to the Colors”.